Let’s just call this liquid gold my friends. Tomatillo Salsa Verde, made from beautiful tomatillos (these are the green tomatoes you’ll see at the farmers market with a husk coving them), charred peppers, cilantro, and cumin. 1. I roasted 3/4 of the tomatillos in a hot 500 deg. F oven until the juices were sizzling out of them and they were slightly charred. I kept the other 1/4 raw to make sure the end product still had a nice green color. 2. I added quite a bit more cumin and then what really sealed the deal – smoked spanish paprika from Penzeys Spices. Its great flavor comes from being naturally smoked over oak fires. Note: I checked with the University of Missouri Extension services to make sure these changes were safe which was a very useful discussion to learn about canning safety!It is extremely important when canning things like salsa or other vegetables that you use a tested recipe from either the National Center for Home Food Preservation, a state extension, or Ball Canning. These groups laboratory test their recipes for numerous requirements to ensure proper canning techniques and processing times that are utilized based on food acidity. The spiciness can be adjusted by using hot or mild peppers, or by adjusting the mix of peppers. You should not, however, increase the number of pounds or cups of peppers in the recipe; as well as onions. Increasing or decreasing the amount of peppers or onions can impact the acidity of the product, potentially making it unsafe. Enjoy salsa verde as a simple appetizer with tortilla chips, added to a chicken tortilla soup, or smothered on enchiladas. It will definitely add deep flavor to whatever you choose! If you make this Tomatillo Salsa Verde recipe, tag me on instagram with #heartbeetkitchen, or @heartbeetkitchen! Have jars ready for canning, sterilized and hot. Preheat oven to 500 degrees. Place 3/4 of the chopped tomatillos on a baking sheet, reserve remaining 1/4. Roast in the oven for about 20 minutes or until they are slightly charred and their juices are seeping out. While they are roasting, chop the onion and peppers in a food processor. Remove and put into sauce pot you will be using to cook. Then remove tomatillos from oven, let cool a few minutes, and pulse in food processor along with the 1/4 raw tomatillos that you reserved. Add all tomatillos to the sauce pot that has the onions/peppers, along with the garlic, cumin, paprika, salt, vinegar, and lime juice. Bring to a boil and then turn down heat to a simmer for 10 minutes. During the last minute of cooking add the minced cilantro. Ladle hot salsa into hot sterilized jars. Place sterilized rings and lids on top, then return to boiling water bath for 15 minutes. Remove and let cool, listen for the pop! Hi Melinda! 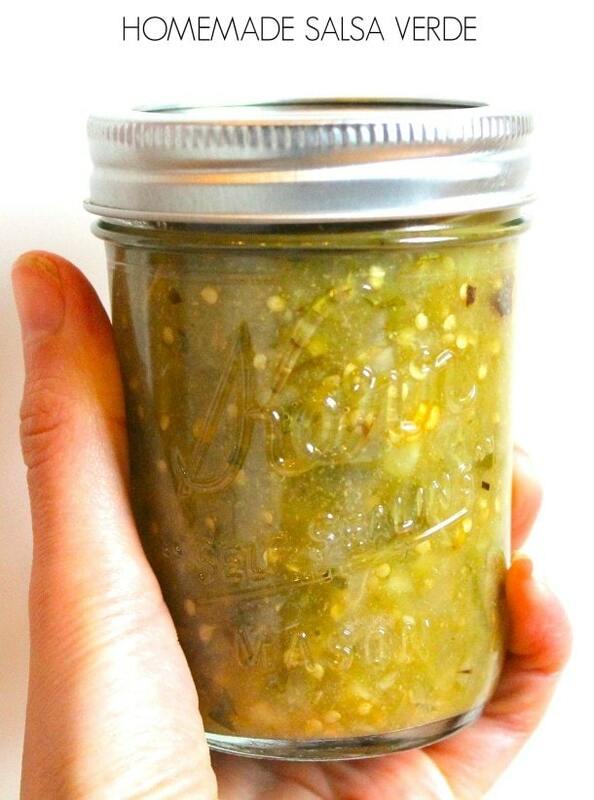 Leave about 1/2 inch headspace for this salsa verde canning recipe. Thanks for the question! Hi I was wondering if I can use a steam canner instead a waterbath? Hi! I’m not familiar with a steam canner, so not sure. Sorry! Hi Lesa! If you can this salsa, you leave it on your shelf in a dark spot for up to 18 months. Then once opened it will last in the refrigerator for 3-4 weeks. If you do not hot water bath can it, it will last in the refrigerator for 1 month once opened. Hi Staci! 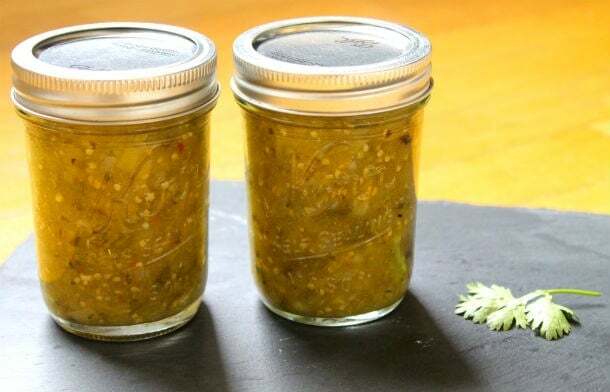 For a mild-medium version of this salsa verde I typically use two medium sized jalapenos with seeds or 1 jalapeno and 1 thai chile. Maybe try that with one batch as a guide, then make it spicier if you like the next time. Enjoy! Do you cover when you simmer? Yes, you can cover it while simmering. I made the salsa today & I have to say it turned out beautiful. I love the bite that you get from the jalapeño. Thank you for the recipe. Hi, I made this salsa verde recipe and unfortunately I used lemon juice instead of lime juice. Recipe is very sour, so how can I rectify this? Can you help? Hi Delia! If you used lemon instead of lime juice, you can subdue the sourness by dissolving some sugar into it. This counteracts the acidity. Each time you open a jar, pour the salsa into a saucepan and bring it to medium heat. Stir in 1/2 tablespoon of sugar, then bring to a light simmer. Cook for about 4 minutes to help the sugar to dissolve. Taste, then add a little more sugar if still too sour. You can then add it back to the jar you canned it in and store it in the refrigerator. Hello! It is 5 1/2 cups chopped tomatillos total (before roasting), then roasting all but about 1 cup of them for the part of the recipe that calls for the raw tomatillos. Hope that helps, enjoy. Hi! I was just wondering if I could substitute the tomatillos for Green Tomatoes? Also, how much would the flavor change without the smoked paprika (though that sounds amazing!)? Hi Tiffany! I wouldn’t suggest green tomatoes because I think it will be too tart. You could go without the paprika though, it just adds a slight smokiness but is still great without it! About how many pounds of tomatillos does it take to get the 5 1/2 cups chopped? Hi Jennelle! About 2 pounds tomatillos will equal the 5 1/2 cups chopped. Thanks for the recipe. If I am going to skip canning this should I omit the vinegar? I have ruined entire recipes at the very end when I toss in vinegar. Hi! You won’t be able to taste the vinegar at all. There’s so little of it, and it must be used for canning otherwise it will spoil. I was wondering how much salsa canned will I have with this recipe? I’m thinking of Christmas presents this year. Thanks, it sounds super yummy and easy to prepare. hi Mary! this makes 4-5 half pints, which are the size jars you see pictured above. After filling the hot jars and putting lid/ring on do you completely cover over the top in the water bath? Can this be done without onions and garlic? My son has a food intolerance, sadly. I could make up the volume with peppers, but I don’t know if it effects the preservation? Hi Marie! I have a feeling that would affect the PH too much so would not recommend since I am not a professional canner. Do you recommend distilled white vinegar? Or did you use apple cider vinegar? Tomatillos are not onions, they are in the tomato family and are easy to grow just like tomatoes. I’m sure you know they aren’t green onions.. but your description says- green onions with the husks on them. Yes, you are correct, thanks for catching! Can I double or quadruple this recipe and can in pint jars? I have 22 lbs of tomatillos! Yes, certainly! just make sure to adjust all the ingredients according to the pounds of tomatillos you have. Thanks for sharing this recipe. We like the flavor and found the recipe easy to follow. As I planned to can the salsa, I really appreciated your safety instructions-I appreciate your research. We canned 4-8 oz 1- 4 oz and had another 4 oz to taste and refrigerate-I don’t think this will last long! DO you have to blanch the tomatillo’s like tomatoes before roasting? I’ve never heard of putting paprika or cumino in salsa verde and we always blanche and peel the tomatillos. The skins are tough! It’s an interesting take on such a culturally traditional sauce. I made this last year and loved it very much. One thing I can’t remember is if I used fresh lime juice or bottled. I know when canning this can make a difference. Can you please let me know which one should be used. THANK YOU. Hi Michelle! Fresh lime juice is best.